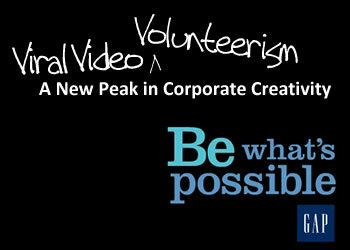 Employees filmed their volunteer events and submitted the videos, ranging from 30 seconds to two minutes, to be posted on www.pressplayatgap.com. The submission period lasted three weeks and was followed by a brief voting period; the winning videos received $10,000, $7,500, and $5,000 grants for first, second and third places, to donate directly to their featured nonprofit partner. In addition, the “fan favorite” award winner the video viewed most received $2,500. Gap encouraged employees, friends, family, customers, nonprofits and the general public to vote. And here we see yet another example of how corporations are using social media to their advantage; Facebook was used as the primary social networking tool to promote Gap’s work. To understand a bit more about the framework behind such a project, we recently interviewed Gail Gershon, Director of Employee Engagement at the Gap Foundation, to ask her a few questions about the thought process behind this pilot contest. onPhilanthropy (OP): What led Gap to implement this pilot program? And how does such a program fit within the context of Gap’s larger philanthropic platforms? Gail Gershon (GG): As a global retailer with a diverse employee base, we are continually looking for new ways to engage our employees and customers in the community work we do. We launched an employee video contest to encourage our employees to share the great volunteer work they are doing and highlight the nonprofits they support. We wanted to increase employees’ engagement with the community and support nonprofits through both time and money. In addition to the contest itself, we encouraged our store teams to continue utilizing one of our core programs our Field Team Grant Program. In this program, for every 25 hours a store team volunteers with a target aligned nonprofit, the store can allocate a $250 mini grant to their partner nonprofit. OP: What was Gap hoping to accomplish by implementing this program? GG: Our goal was to engage our employees in a new and innovative way to inspire and encourage them to continue supporting the communities where we do business. Our hope was to increase employee pride and loyalty in working for Gap Inc. and celebrate the great partnership between our employees and the nonprofits we support. We are currently exploring expanding this program next year and are considering engaging all of our brands at the same time, or possibly focusing on each brand separately as we did with the pilot program. To take a deeper look at the impact such a project has on the nonprofit community, we interviewed Kris Nakamura, Executive Director of the Life Rolls On Foundation, the nonprofit organization who won the $10,000 first place prize. First, some relevant background information: Gap employee Toby Goode became a strong supporter of the Life Rolls On Foundation (LRO) after being introduced to the organization through her daughter, Devyn Bisson. Through Toby’s involvement as a volunteer, Gap employees have become regular champions of the organization’s mission, which is to improve the quality of life for young people affected by spinal cord injury. Certainly, the highlight of Gap’s involvement with the Life Rolls On Foundation is the announcement that LRO won $10,000 by receiving nearly 4,000 votes in the pressplayatgap.com contest. OP: How were you initially contacted about this program? Kris Nakamura (KN): Under the leadership of Tammy Kielar, store manager of Gap and Gap Kids in Huntington Beach, Gap Seaside District contacted our office to request permission to document its employees’ volunteer efforts at Life Rolls On’s They Will Surf Again program, a quality of life program that empowers the SCI community to experience the freedom and mobility of surfing a wave with the assistance of adaptive equipment and able-bodied volunteers. They explained this footage would be used to create a video for the pressplayatgap.com contest. OP: What role did LRO play in ensuring the success of this program? KN: We informed individuals through our website and online social networks about the contest, encouraging them to vote once each day for LRO from August 31 through September 6. Some of our corporate sponsors and celebrity supporters, such as Hurley and recording artist Jason Mraz in turn contacted their friends with the pressplayatgap.com contest details in their mailing lists and added the contest link on their websites as well. We also issued a media alert about Life Rolls On’s involvement in this competition. about volunteering at some of our events. We are extremely grateful to extraordinary individuals, like Tammy, Toby, Devyn and others from Gap Seaside District who believe passionately in our cause. We know it was only through their vision and hard work that others found LRO’s video worthy of their votes. Overall, Gap felt this was a very inspiring, innovative and fun employee engagement program. They were very pleased to launch this with Gap Brand and believe it will have a long lasting, positive effect on store employees and their community partners. They were pleased with the results of the program and now have a benchmark to use for the next contest. Over a one month period, the contest micro-site received more than 150,000 page views and more than 30,000 visitors. These results indicate the interest level their employees have and also show great alignment with the growing trend of incorporating Web 2.0 technology with philanthropy.